With Great Power the latest chapter in Marvel’s peak behind the curtain of parallel superhero realities and alternate costumed crusader histories, tears down the barriers between worlds that are separated by a single decision, event or course of action, to present a compendium of tales of what might have been. 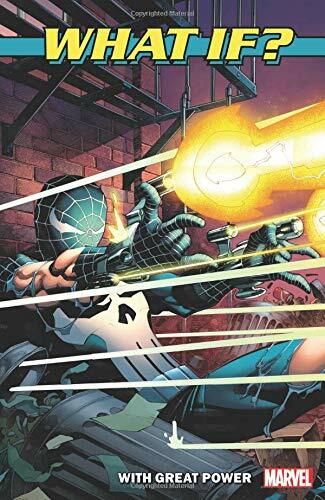 Although the title would suggest that With Greet Power is a Spider-centric anthology, in reality only a third of the six entries are given over to the arachnid powered avenger, the first exploring what might have happened if Flash Thompson had become Spider-Man instead of Peter Parker and the second imagines what might have happened if Spider-Man adopted the role of the Punisher. The former charts Flash’s journey of self-realisation in which his Spider-Man is a rage infused avatar of justice who balances on the thin line between law and chaos before becoming everything that he despises which ultimately leads to him discovering who he really is. While the latter charts a different course and argues that no matter what cards fate deals, an individual’s true character will always emerge to guide them to be the person they were supposed to be. And that Frank Castle’s destiny always leads him to the same point and that he cannot escape who he was always supposed to be; The Punisher.